We measure our impact in different ways: the number of free trees grown and given away each year, how healthy planted trees are a few years later and the stories we hear from tree recipients. Our mission statement boils it down: Forest ReLeaf is a catalyst for restoring and sustaining our urban forests. With the help of thousands of volunteers, we are planting trees and enriching communities. Started from seed or bare root seedlings, our staff and volunteers are growing more than 20,000 trees in our 6-acre nursery, CommuniTree Gardens, located in Creve Coeur Park in Maryland Heights, Missouri. Each spring and fall thousands of these trees are given away for free to groups for public and nonprofit planting projects throughout Missouri and the surrounding regions. Details on our tree distribution programs can be found here. Education and outreach is another key element of Forest ReLeaf’s mission. 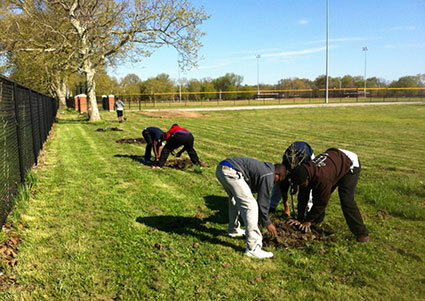 Each year we offer a number of community outreach opportunities including our free, 6-week TreeKeepers Class, Tree Camp, educational classes, outreach events, and access to St. Louis area Urban Tree Canopy reports. For more, click on our LEARN section. Working collaboratively with other forestry organizations and corporate partners, Forest ReLeaf successfully leverages its funding for the benefit of everyone. For example, the Missouri Department of Conservation and Forest ReLeaf administer the Missouri Forestkeepers Program, an effort that has grown to more than 3,000 members statewide and created an army of tree advocates and observers. Trees matter. This infographic gives a glimpse of how much our community trees and forests contribute to making our world a better place to live. Forest ReLeaf of Missouri repeatedly earns both the Better Business Bureau’s standard as Accredited Charity, and GuideStar’s highest level Gold status.